Fight cold proud snow, red plum open the earth, to achieve revival. These two familiar couplets make people happy and hearten. It reveals the love and unique feelings of the literati and scholars in all dynasties. "Wind stallion" and "proud snow cold plum" implied meaning as long as there is spirit, spirit, confidence, strength, we will be able to let the national rejuvenation, let the dream flying. Lu qiu, the founder of the famous ice and snow school, loved plum blossoms and even became obsessed with them. The plum blossoms with different expressions are lu qiu's understanding of nature and his perception of life. He's proud of snow cold plum is clearly suffering of the Chinese nation and a symbol of strong, he creatively combined with the plum blossom, the snow will sketch concept of modern painting and combination of traditional Chinese painting skills, gives modern people to the plum blossom new character spirit with his decades for the accumulation of traditional culture and life history. Unconventional, unconventional, unique, their own school of painting - "ice and snow plum". He put the plum blossom in the world of ice and snow, the plum blossom ling cold proud snow alone to show the spirit of incisively and vividly, but also highlights the plum blossom vigorous and vigorous spirit and spirit. Recently, I came across Mr. Lu qiu in the "lu qiu plum garden" of the beautiful furong zhang. Truly understand Mr. Lu qiu's artistic accomplishment and studious spirit as well as his honesty, open and aboveboard, generous to others. The real meaning of Mr. Lu qiu's persistent creation of ice and snow plum blossom lies in his interpretation of his enterprising spirit. At the same time, also established his ice and snow plum creation localization: gets the contemporary spirit, wears the thousand years charm. Lu qiu (feng changshou) was born in 1948 in a poor peasant family in yucheng, shandong province. When he was a child, he was clever and clever. In the early 1970s, lu qiu came to northeast China alone for a living. In the mountains, he lived in a horse shelter, drove through wasteland, planted land, cut hair and painted portraits for villagers, met poisonous snakes and beasts, endured unimaginable hardships and dangers, and once stepped into the most difficult journey of his life. No matter in the trough of life or in the spring, lu qiu never gave up the persistent pursuit of art. It was his life experience under certain historical conditions and his firm belief in the art of painting that gave rise to his strong desire to express plum blossoms, especially snow and ice plum blossoms, and his artistic achievements with unique styles. After going through all kinds of hardships, Mr. Lu qiu was recruited to the union of agricultural bank of hunjiang city. Full of passion, he worked hard to finish his job. In the spring of 1986, the trade union of the head office of the agricultural bank of China issued a notice to the trade union of the branches of agricultural bank of China, collecting calligraphy and painting works of the system of agricultural bank of China for exhibition and competition. Mr. Lu qiu rushed into the arms of changbai mountain full of passion. He made a field trip to changbai mountain to capture his creative materials and created more than 60 works of art. His paintings "changbai mountain birch" and "tianchi view wins" won the first and second prizes of the national banking system art exhibition. He began to make his mark in painting. 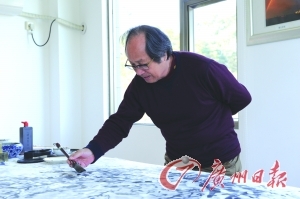 Lu xueqin, a famous painter and vice President of the shandong artists association, who was lecturing in hunjiang, nodded his head repeatedly and praised Mr. Lu's works: "the brush and ink are vigorous and the technique is free from vulgarities." Write an inscription on the spot: "north state-owned good tree, a cold incense outside the wall." On July 8, 1985, People's Daily published the recruitment notice of Chinese calligraphy and painting correspondence university. Feng long accepted the application and was admitted successfully. From then on, in addition to finishing his own work on time, he stayed in the office after work every day and studied correspondence textbooks and practiced painting and calligraphy. In the summer of 2003, Mr. Lu qiu returned to Beijing. Enter the national advanced research class of fine arts theory and painting and calligraphy creation of tsinghua university, and the special training class of flower and bird creation of freehand painting of gao people. After graduation from the Chinese national academy of painting. Become a professional painter and calligrapher. He began to display his artistic talent in the field of Chinese painting. Lu qiu, in the journey of life step by step, a footprint with a success. His persistent pursuit of art is precisely because of his life experience in certain historical conditions and his firm belief in the art of painting, which gives rise to his strong desire to express plum blossom, especially snow and ice plum blossom, and his artistic achievements with unique styles. Lu qiu's works have repeatedly participated in domestic and foreign painting and calligraphy competitions, repeatedly winning awards. He gradually became the leading figure of Chinese cold incense painting school. First, the organic combination of ice and snow and plum blossom, not completely using the alum technique, to "leave white" as the main means of creation. Second, in large scale works, the landscape into the plum creation, the plum rooted in the earth's character, lofty. Third, the traditional painting and western painting literacy into a furnace, the picture is not limited to the performance of lines, the full use of color, block surface, perspective elements, Chinese and western combination, do write snow plum colorful. 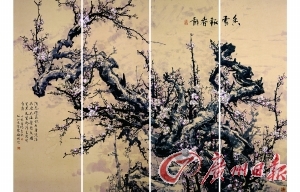 Four, in the traditional painting, is all the folded branch plum, one branch plum. Lu qiu often painted plum trees, merlin, macro reproduction of natural images, the performance of grand theme. Lu qiu had a career as a journalist. So, while writing news articles, he also wrote prose and reportage. Major representative works are: "the moment of justice and evil struggle", "desert poplar". The works are characteristic of The Times, reflecting the spirit of The Times and eulogizing the main melody of The Times. Lu qiu wrote poems as well as paintings. He is highly cultivated in poetry and literature. Each painting has poems and lyrics, which organically combine the unique artistic expression of Chinese painting with poetry, calligraphy, painting and printing. It is because of his extraordinary life experience and profound cultural accumulation that Mr. Lu qiu has formed his artistic style of "cool and elegant, vigorous and unusual". The gallantry of snow and ice in his works is often expressed in blank Spaces. And the "full" and "blank" in the work form a dialectical. In addition to skills or endless white space imagination, but also a life attitude. Lu qiu mei painting, from the "law" into the "way", and the unity of the heart painting, when the heroic ancient and modern. The style of the painting depends on the artist's understanding of natural objects. The state of the painter also naturally determines the style and taste of the work. As far as the plum painting is concerned, too sparse is cold, not enough to feel the rhythm of life; And too numerous and as the street, congestion and suffocating. 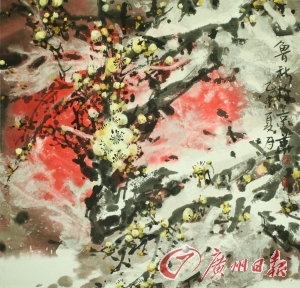 Lu qiu described the plum blossom dense, static and moving, it can be described as various, extremely vernal charm. When we look at his paintings, no matter they are large or small, we can appreciate his distinctive artistic pursuit and unique style. His style and taste have been greatly enhanced. The success or failure of a work depends mainly on its situation and composition. Many painters have no intention but regret for the lack of composition ability. Lu qiu's paintings are very particular about composition. His works in the concrete with new ideas, the illusory beauty, god shape is all ready, wonderful infinite, is worthy of the plum painting composition master. 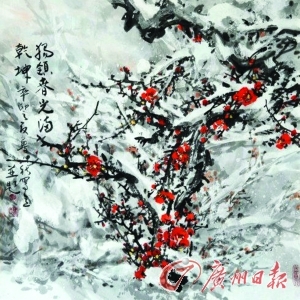 LuQiu painting art creation, has from mature to a higher peak sublimation of art, especially his ice plum blossom is the main theme for the creation of art to life, will certainly show more broad prospects and space for him, LuQiu good artistic accomplishment, studious spirit and his disposition of honest, open, live and let live, will be irreversible into his artistic creation, life and spirit is the immortality of his artistic charm. LuQiu for decades, he in the kanto earth, in the practice of realism creation path, efforts to innovation, on the basis of inheriting the traditional in dabble in the creation of landscape, flowers and birds, etc all kinds of subject matter, gradually show the distinctive style of ice and snow of plum, his creation of ice and snow the plum blossom, beautiful, lively, majestic, artistic conception far-reaching, highlights of pride, gas is integrity of high precision and become "kanto pie" plum blossom project drawing a painting article, character word of mouth of painter. "Qiu zhi around irons, rigid and graceful"
The brushwork is vigorous and the technique is free from vulgarity. North has a good tree, a cold incense. In 1996, he won the prize of excellence in the "world peace and friendship international painting and calligraphy art competition" in commemoration of the 50th anniversary of UNESCO. In 2000, he was invited to participate in the second international art fellowship exhibition held by Korea international artists association and won the first prize. In 2001, won the first prize in the 5th china-south Korea calligraphy and painting exchange exhibition held by hanyang fine arts writers association of the republic of Korea. In 2006, the exhibition national brand charm, Chinese painting and calligraphy master competition won the gold medal. In 2007, he held a painting and calligraphy exhibition in shenzhen museum. In 2008, lu qiu's solo painting and calligraphy exhibition of contemporary ink art was held in guangdong provincial federation of literary and art exhibitions. In April 2009, luqiu calligraphy and painting exhibition was held at the CPPCC calligraphy and painting exhibition center in foshan city, guangdong province, for the first anniversary of "May 12" earthquake relief. In 2010, the provincial painting and calligraphy exhibition of lu qiu was held in shandong art museum. In 2011, he participated in the ink painting art exhibition in 800 art district of Shanghai. In 2012, "mei jie lu qiu ink art collection exhibition" was held in guanshanyue art museum in shenzhen.